Thoughts from a Traveling Tech: Answered: Where in the world am I? Last Friday I posted this picture and said that I would be revealing the answer today. Well, believe it or not, this is the famous St. Louis Gateway Arch! This picture was taken on a crisp clear November day as the sun was rising in the morning and reflecting off the metal structure. The brightness of the reflection causes the camera to darken the sky behind the structure and create this amazing call. Here is another view that I took as we were walking up to the arch through the park. Amazingly the sun is actually shining against the seam and reflecting back at us. 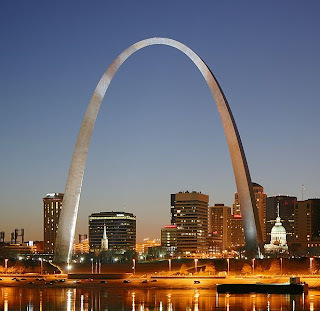 The arch is an amazing work of art and architecture built from 1963 - 1965 the arch stands a towering 630 ft (192m) above the St. Louis waterfront. It is actually the tallest memorial in the United States as well as the tallest stainless steel monument in the world. At an estimated $95,000,000 in today's dollars, something tells me that this is one monument that won't be surpassed by a new one anytime soon. The amazing thing is that you can actually go up into the arch and view the surrounding area from the top of the arch. Just be prepared to go through the same security that you experience at the airport to get a chance to go up the arch's tram system. I recommend you take the time to visit if you ever get a chance to go to St Louis, Missouri.